It is recommended that shading be avoided between 9am and 3pm, since the most of the solar energy to heat the water is received during this period. Partial shading of parts of the collector in the afternoon will have little effect. Shading generally has the biggest effect in winter, when the sun is lower in the sky all day and its path and solar intensity is lower. Buildings – close to the roof where the solar collectors of the solar geyser are to be installed. Future buildings – there may be no shade from existing buildings, but take into consideration what is likely to be built in the future and where. 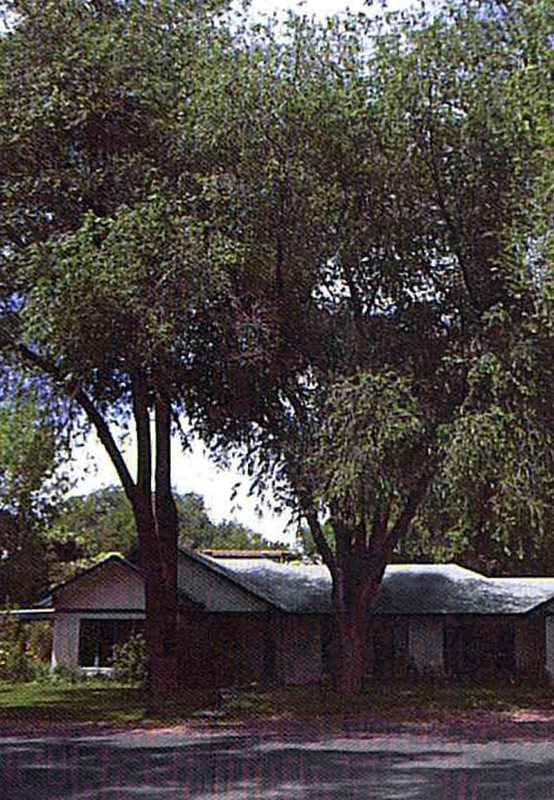 Trees and Shrubs – the problem with trees and shrubs are that they grow taller! Often they may not be a problem at the time of installation of the solar geyser, but they may grow and shade the collectors some years after the installation. 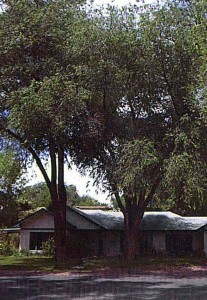 Tree owners often don’t foresee this problem and are reluctant to cut the trees down. The picture clearly shows the problem associated with rapidly growing trees. Parts of the building – shading by parts of the building on which the collector of the solar geyser are to be installed can be a problem. Collectors of the solar geyser on a roof close to an upstairs room may be shaded for part of the day. What can be done about shading? Removing the source of shading – it may be as simple as pruning back a tree or even removing it. Relocating the collectors of the solar geyser – install the collectors of the solar geyser higher up on the roof or on another part of the roof that is not going to be shaded. It is possible that if collectors of the solar geyser are a long way from the point of use, a close-coupled solar water heater system should be replaced by a pump-circulated solar water heater system, with the hot storage cylinder near the main point of use (kitchen) and the collectors of the solar geyser a long way away. Well-insulated pipes are required. Adding additional collectors for the solar geyser – to compensate for the effect of shading. Using an alternative form of solar water heating – the bottom line is that a solar water heater system is an expensive piece of equipment. If it is to give good return on its capital investment, it needs to be performing for as much of the year as possible. If it is not going to do that, then its installation of the solar geyser system is inappropriate. Ignore it – if the shading is in the early morning or late afternoon it can probably be ignored. Partial shading and then only in the middle of the winter can also possibly be ignored. If the collectors of the solar geyser are shaded in the middle of the day and the shade extends right across the collectors of the solar geyser, then it cannot be ignored. The shade will significantly reduce the output of the collectors of the solar geyser. Shading is most likely to occur in winter when the sun is lower in the sky. An installer needs to know how far above the horizon the sun will be on the shortest day, at noon. On the 21st June, the sun is lowest in the sky all day. 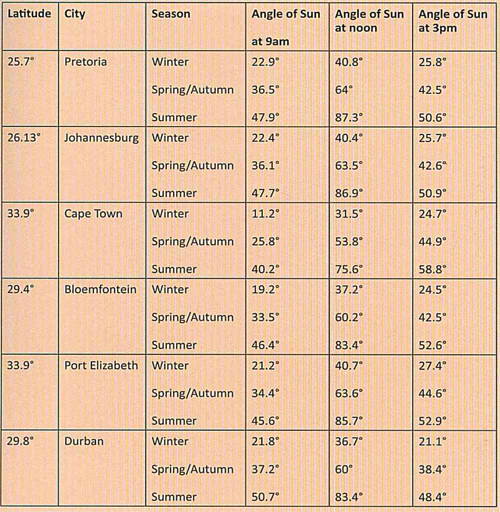 The table shows the 9am, midday, and 3pm angle of the sun above the horizon (called the altitude angle) for the shortest day (winter), the longest day (summer) and middle of spring and autumn for various locations in South Africa. Using a compass and inclinometer, the installer should find where north is and then measure the altitude angle of any potential shading objects to north, northeast and northwest of the solar geysers collector’s position. Measurements should be taken from the lowest point of the solar geysers collectors to the nearest objects to the north. The installer must now decide whether the solar geysers collectors will be shaded between 9am and 3pm.